There’s something very special about mornings, in the Midwest. There is so much sunshine from the uninterrupted sprawling sky and the way it cascades across the land and tree tops. I’ve spent my life playing tug-of-war with my feelings over living in the city and life in the country for quiet and solitude. 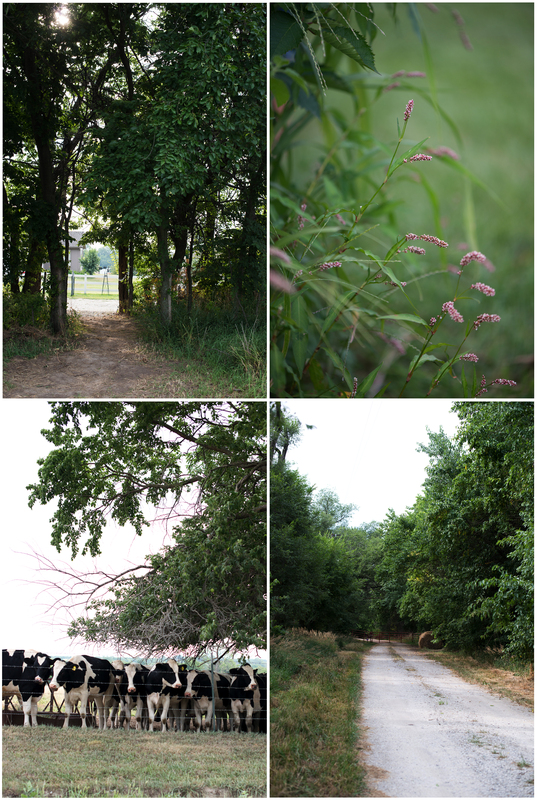 Having spent my childhood on a small farm, in-the-middle of nowhere, I find that I really connect with the farmlands and how it provides what we eat and how it looks and feels to me when I’m driving it’s dusty roads. As I grew older, I started feeling restless and all I wanted was to travel the world. I wanted to be surrounded by city culture, see far away places, and have what I wanted at my finger tips. Give me Paris, London, and Rome. Anywhere but here. Even though I knew that I didn’t belong in the middle-of-nowhere, I still couldn’t deny the beauty that existed there. Traveling on my way to do a bit of blackberry picking, brought back memories of what I loved the most about the Midwest. The dirt roads, the green fields, the never ending horizon, and the stillness. 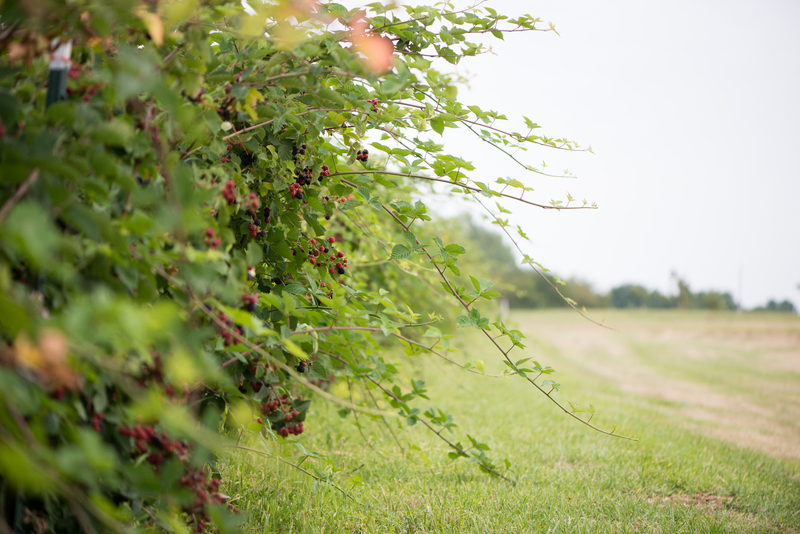 Small farms are spread out, each one with it’s own charms inviting you to stop and explore. I arrived at the loveliest of all, Gieringers Orchard. 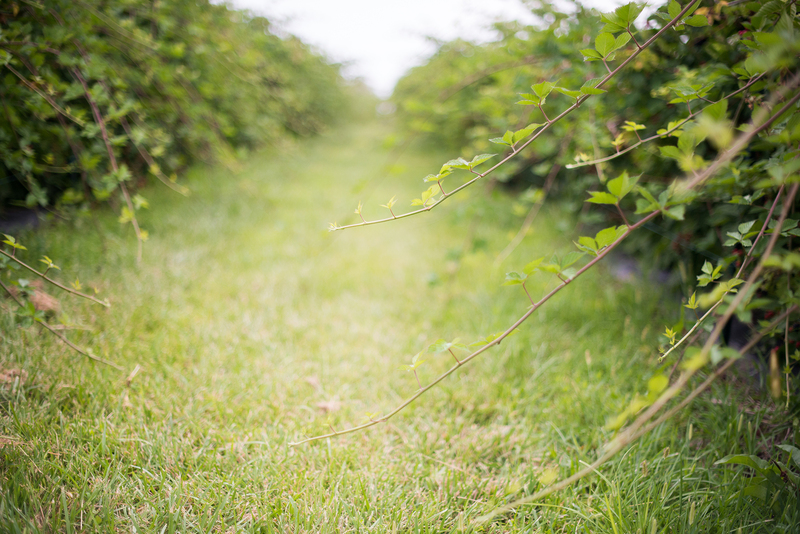 A vast space filled with gorgeous apple trees, berry bushes, green houses full of vegetables, and smiling faces. Everything vibrant green and thriving. There was more than enough space for picking and I had an entire row to myself. As I picked and burrowed myself into the bushes looking for the juiciest and darkest blackberries, I could have died of happiness. It felt like home. It didn’t take long to fill my berry box. 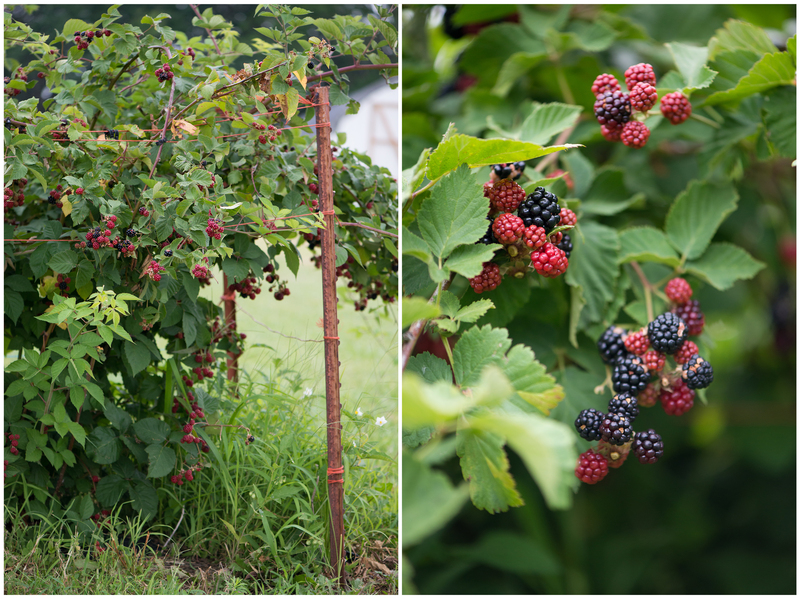 They were the sweetest, plumpest, juiciest blackberries I had ever tasted. They were still warm from the sunshine and it made me think of a warm caramel. A blackberry caramel. 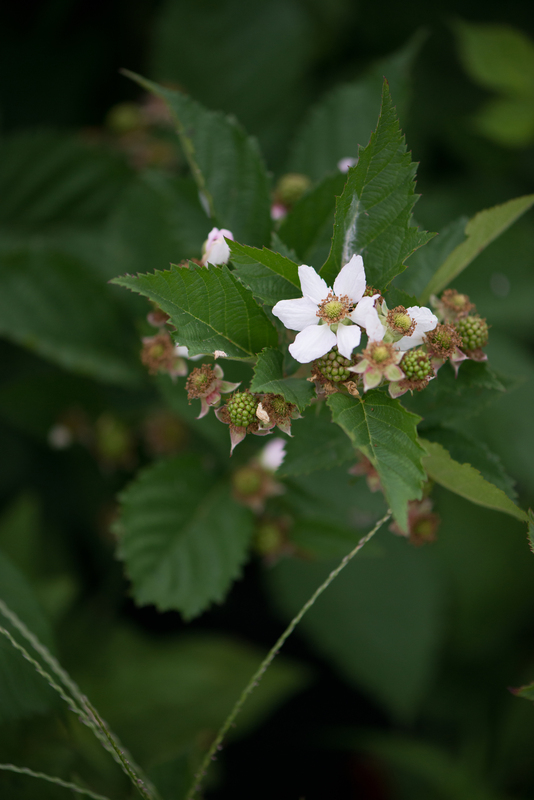 The flavor of berries can be brightened up with a little citrus and the blackberries were so sweet. A little tartness from lemon was in order. 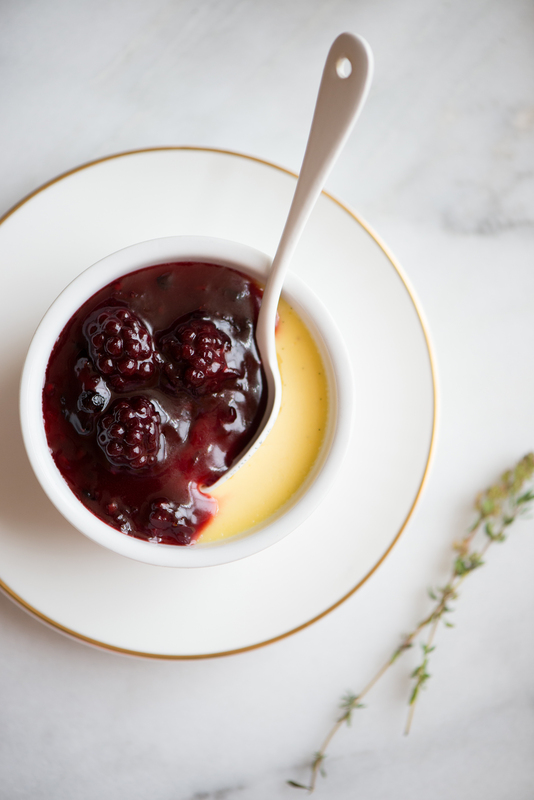 I love the comfort of pot de creme and since it’s summertime, a tart lemon pot de creme with a sweet blackberry caramel sounded like heaven. Preheat the oven to 325F. Bring a large pot of water or large tea kettle to a boil and set aside. Put 8 six ounce ramekins in a large baking pan with high sides. Set it aside until ready to use. In a small saucepan, combine the lemon zest, juice, and 1/4 cup of the sugar. Simmer until reduced to 1/2 cup, about 10-15 minutes. To check your progress, keep a measuring glass nearby and pour mixture back into your pan if it needs more reducing. Once you reach 1/2 cup set it aside. In a medium saucepan, combine the cream, 1/4 cup of the sugar, and the vanilla seeds. Bring to a simmer. Meanwhile, in a medium sized bowl, whisk the egg yolks with the remaining 1/4 cup sugar until combined. Slowly, whisk a ladleful of the hot cream into the yolk mixture. Continue adding your cream and whisking continuously until it has all been added to your bowl. Whisk the mixture back into the saucepan over medium-low heat and cook slowly, stirring constantly, until the mixture reaches 170°F on an instant-read thermometer, 3 to 4 minutes. Whisk in the reserved lemon syrup and strain immediately through a fine sieve into a clean bowl. Pour the mixture into each ramekin, about 3/4 full, and set back into the large baking pan. Pull out the oven shelf just enough to rest the baking pan on it, making sure that it’s stable and won’t tip from the weight of the baking dish. Pour enough of the reserved boiling water into the pan so that it comes halfway up the sides of the ramekins. Lightly rest a sheet of foil over the ramekins, do not crimp the edges down, and bake for 25 to 45 minutes. Begin checking them at 25 minutes until the custards are set about 1/4 inch in from the sides and the centers respond with a firm jiggle when you nudge the ramekins. The custards should register 150° to 155°F on an instant-read thermometer. Allow the custards to cool to room temperature in their water bath. Remove the custards from the bath, cover them with plastic wrap, and refrigerate for at least 8 hours. When ready to eat, add a spoonful of the blackberry caramel or a nice dollop of chantilly cream (sweetened whipped cream). In a small saucepan, bring your cream to a simmer, then set it aside. In a medium saucepan, add sugar and allow it to dissolve over medium heat until it reaches a medium amber caramelization. Do not walk away from your pot. It will only take a few minutes and you do not want to burn your sugar. If you begin to have spots that are turning darker than the rest of the pot, gently swirl your pan around as it cooks to even out the color. Once it reaches the medium amber stage, remove it from the heat and add your warm cream. The cream and caramel will bubble up, so be careful. Whisk the cream and caramel together and place back over medium heat. Add 1/2 cup of smashed blackberries and thyme leaves to the caramel, whisking to combine. Bring just to a boil, then strain into a clean bowl. Pour the strained caramel back into the pot and gently stir in 1/2 cup of whole blackberries and add salt.